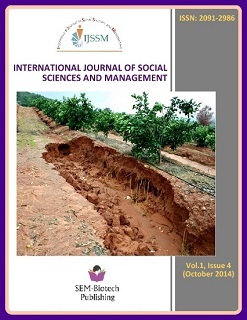 This research was conducted in the month of June (2012) at Chisapani, Nagdaha and Kathjor VDCs of Ramechhap district of Nepal to analyze the impact of sustainable soil management practices on household food security. Pre-tested semi structured interview schedule were used to collect the primary data from 120 farmers, 40 farmers from each VDC by applying simple random sampling technique. It was found that before adopting sustainable soil management practices the food sufficiency from own production was 3.98 months and after the adoption the food sufficiency months was 7.67 and farmers perceived that there is increased access to food. Similarly, the income and expenditure on food consumption before the adoption of practices were Rs. 25758.33 and Rs. 12133.33 respectively and after the adoption of practices were Rs. 51675 and Rs. 7175 respectively. Farmers expressed that increase in production and productivity was major reason in adopting sustainable soil management practices. The increase in the production and productivity was the main reason for contributing towards household food security. Lack of irrigation facilities was major problem in adopting the sustainable soil management practices. The study revealed that sustainable soil management practices had significant impact on food sufficiency, income and production of different crops which ultimately results to improvement in food security in the study area than before. Finally, this study concludes that the sustainable soil management practices had high contribution to household food security.